Tsukasa plays a game while Nasa works on a database project for someone. She marvels at his concentration skills and decides to distract him. As such, she turns off her game to watch a quiz show. Even though Tsukasa engages Nasa about the show host Taki-chan, whom they once saw at a bus station, Nasa never stops working. This causes Tsukasa to up the stakes with a fig by challenging Nasa to participate in the quiz. As the first math question is given, Tsukasa struggles to figure it out. Nasa continues work but correctly answers the question. He even explains how the answer is achieved, again without stopping work. 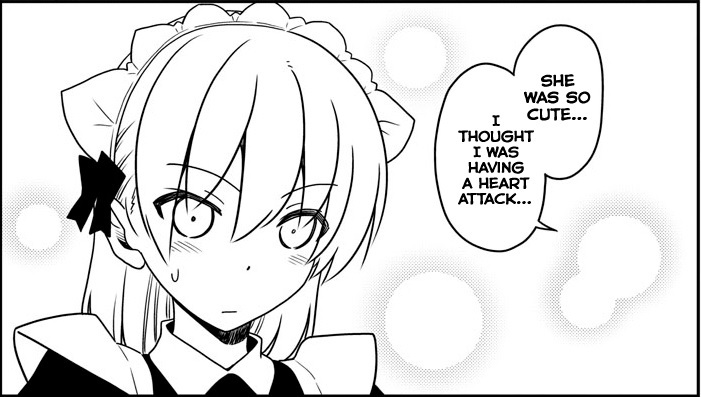 Aya and Chitose’s maid Charlotte enter the room, determined to assist Tsukasa’s efforts. The next question is given, but as the girls struggle to find an answer, Nasa easily gives it, never stopping his work. Charlotte decides that the only way to distract Nasa is to have Tsukasa wear Charlotte’s maid uniform. Tsukasa reluctantly agrees. Nasa is stunned by this, but when the next question is given, he still has a correct answer in a flash. Heh. Hata-sensei decides to give some marital teasing with Tonikaku Cawaii chapter 47. And I thought it was pretty fun. Nasa may have lost some points on his date with Tsukasa to the aquarium, but he certainly gained points with her when he stated his reaction to seeing her in a maid uniform. Gotta speedily wrap this review of Tonikaku Cawaii chapter 47 up. Always love the color art pages. While I don’t expect we’ll see this series get licensed, if it were, I’d wish for the color art to be included. It was fun seeing Ruka from Hayate the Combat Butler on the TV screen. Still not sure how the two series can be linked without ignoring the time frame Hayate the Combat Butler was set. But I still like seeing the cameos from that manga. 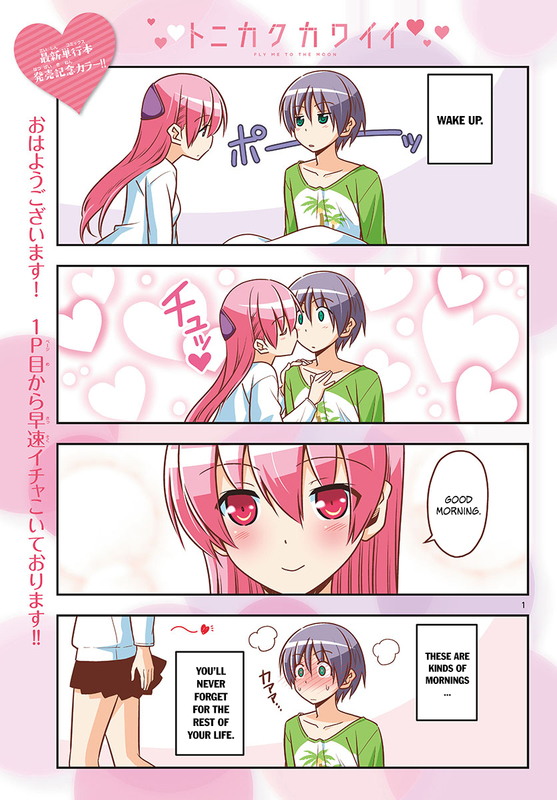 In the end, Tonikaku Cawaii chapter 47 is a fun chapter of a wife attempting to distract her very disciplined husband.